Are you looking for a cat that is going to make a great addition to your family, one that is friendly yet playful, and one that has a very unique appearance? If so, you should learn more about Burmese cats. These cats are friendly and have loads of energy, so if you like a pet you can play with, the Burmese is an excellent option. There is an old saying that you never own a cat, but that the cat owns you. Nothing could be truer of the Burmese cat, who tends to take over the entire household. How much does a Burmese Cat cost? The first Burmese cat was a cat named Wong Mau. This cat came from Burma in 1930 with Dr. Joseph C. Thompson. It was a dark brown colored cat, and many thought it was a Siamese with dark markings. Thompson didn’t think so, and he chose to breed the cat, thus starting the Burmese breed. The kittens looked like a cross between Burmese and pure Siamese cats, and when bred to each other, the result was the dark Burmese we know today. Once the Burmese had been created, it became incredibly popular. So popular in fact that hybrids began showing up in cat shows around 1947, rather than pure Burmese cats. Unfortunately, showing these hybrids was a violation of the Cat Fancier’s Association (CFA) show rules, and the Burmese was completely withdrawn. It was not reinstated until 1953 when the CFA was assured by the Burmese Cat Society of America that this offense would not be repeated. Now we are going to take a look at the physical standards for Burmese cats. This includes size, weight, health issues, and personality traits. These are lovable cats that enjoy plenty of attention, but also like their alone time. 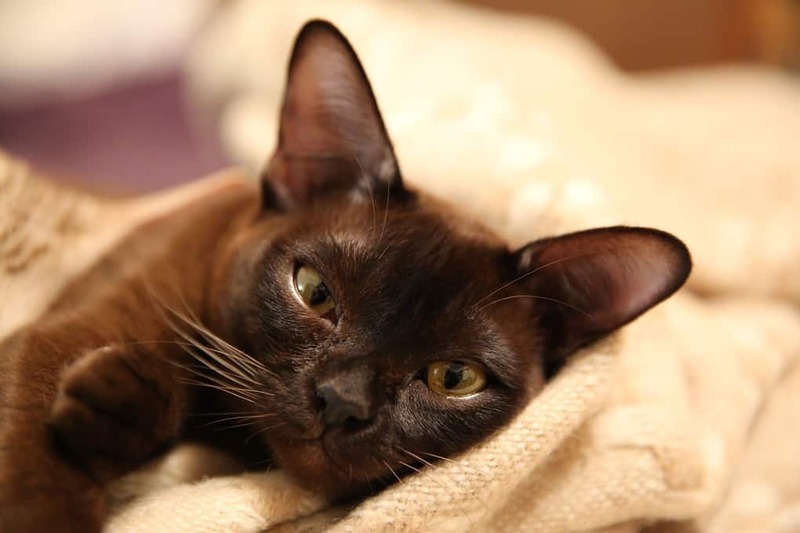 While they are generally pretty healthy with proper care, there are many known health problems associated with Burmese cats that may or may not be genetic in nature. These problems include lipemia, corneal dermoid, orofacial pain syndrome, congenital peripheral vestibular disease, Burmese head defect, hypokalemic polymyopathy, flat-chested kitten syndrome, kinked tail, elbow osteoarthritis, endocardial fibroelastosis, dilated cardiomyopathy, and diabetes mellitus. Grooming a Burmese cat is relatively easy. They have short coats, so they only need weekly brushing or combing to get rid of loose fur and help distribute skin oils for healthy, shiny coats and healthy skin. It is also a good idea to get into the habit of brushing your cat’s teeth regularly. Start doing this when they are kittens so they get used to it early. Burmese cats tend to be short and squat, and are kind of built like bricks. They don’t grow to be very tall or long, but they are pretty wide. These cats usually stand about 8 inches or so at the back, with the males being somewhat larger than the females. Female Burmese cats can weigh between 8 and 12 pounds, while their male counterparts typically weigh around 12 pounds. Because they tend to be squat looking to begin with, they can often appear overweight. If your cat is more than 12 pounds and not largely built, speak with your vet about a weight loss diet to ensure good health. Burmese cats are among the most curious, and they will want to inspect everything in the home. They love to play, and can be trained to play fetch and even go for walks on leashes. They love going for rides in the car, so taking them to the vet is a breeze. This is a cat that will show off for anyone who is watching, and can get pretty active in order to get the attention it seeks. While there are no cats that are truly hypoallergenic, there are ways that you can limit the allergens in your home so even if there are allergy sufferers in the home, you can have a cat. Burmese cats have short coats, so weekly brushing should keep shedding to a minimum. Vacuum your home often to eliminate more cat hair and dander. If you feed your Burmese cat a healthy, well-balanced diet, give it plenty of love and attention, and provide regular veterinary care, your cat could live to be the ripe old age of 15, or even older in some cases. Keep in mind that indoor cats have longer lifespans than outdoor cats. To keep your cat’s coat soft and shiny, brush it weekly to remove dead hair. This also helps to distribute skin oil for healthy skin and fur. Tooth brushing helps to prevent periodontal disease, and this should be done at least once weekly (daily is best). Keep the eyes clean with a soft, damp cloth, using a different cloth for each eye. Check the ears weekly, and clean with a cotton ball moistened with a mix of warm water and apple cider vinegar (half and half). 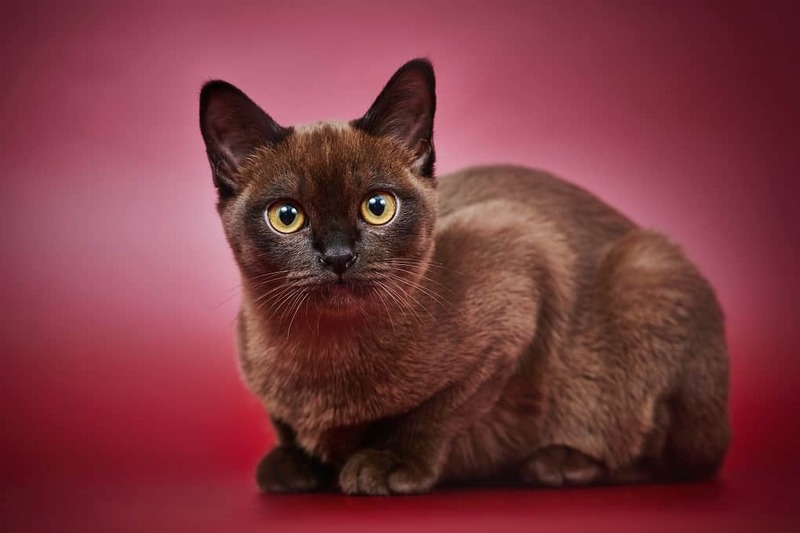 Ideally, if you want a true Burmese cat, you are going to buy from a Burmese cat breeder. Make sure that you research the best breeders, even if it means expanding your search to other states. You will need to find out if the cats are healthy, if they have health certificates from a vet, etc. The breeder should be responsible, and have a clean facility for the cats. You can also check classified ads, and of course, your local animal shelter. You just never know where you are going to find a Burmese or other pedigreed cat. A Burmese cat can cost between $500 and $700. The price will depend on a number of factors, including the age of the cat, and whether it is male or female (males usually cost less). Make sure that it has a health certificate from a vet, and that the breeder is CFA certified. So, are there many different types of Burmese cats? In a nutshell, the answer is no. A Burmese cat is a Burmese cat. But, this is not to say that all Burmese cats are the same. Their colorations may be different from one another, or their markings may be somewhat different. Of course, there is also the personality to consider, and every cat has its own unique personality. Ultimately, your cat’s personality should mesh with your own. Pet ownership is a great responsibility, and once you have a pet, it should be your pet for life. This is a commitment of at least 10 years (hopefully longer), so you need to take your responsibilities seriously. Make sure that your Burmese cat is groomed regularly to avoid tangling and matting, and make sure that it receives regular vet care. Never let your cat outside unattended. An indoor cat is much healthier and happier than one that is outdoors dealing with other animals, the elements, traffic, and humans. If licensing is required in your area, you will also need to make sure the license is always up to date. Now we are going to look at the characteristics of the Burmese cat. These cats are very unique, both in coloration/markings and temperament. They are loving and docile, but won’t hesitate to chase the red dot. The Burmese cat has loads of charm, and a soft, sweet voice. But, it will tend to take over the household if you let it. This cat has a dark, solid brown colored coat often referred to as “sable.” It also comes in blue, champagne, and platinum. Here is a cat that loves attention, and gives as much as it receives. This is an affectionate cat that loves just about everyone. Burmese cats are right at home with children and other pets. They get along great with other cats as well as dogs, and are particularly fond of other Burmese cats. Never underestimate the intelligence of a Burmese cat. These cats are very curious, and they love to get into stuff. The Burmese is not a high-energy cat, but it does love to play. You may have to coax it into a game of chase the string, but once it starts it loves every minute of playtime. These cats do not require a lot of grooming. Weekly brushing will suffice, and regular tooth brushing. Make sure their litter boxes are always clean, and that they always have fresh water. There are different types of Burmese cats, at least when it comes to coloration. 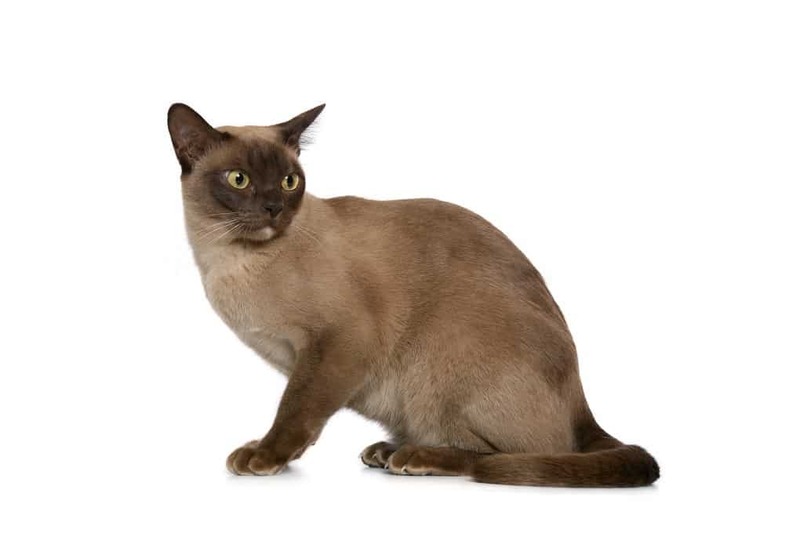 A typical Burmese cat will be dark brown in color, but they can also have lighter coats. Many breeders breed Burmese cats to have coats that are blue, champagne, or platinum. The personality is what you need to consider, to make sure the cat fits in with your family and lifestyle. You really can’t compare the Burmese cat with any other breed. There are other brown cats out there, but none that have the short, stocky appearance of the Burmese. The closest is likely a Himalayan, because they often have similar markings. But, the Himalayan has long fur, whereas the Burmese has a shorter coat. If you are an allergy sufferer, or someone else in the home is, a Burmese is a better option due to the shorter coat. Living with a Burmese cat is going to be a fun experience for the whole family. It will get along great with everyone, including most other pets, and it will love cuddles and play time. Remember that these cats are very skilled at jumping, so it is a good idea to purchase a few cat trees and some perches so your pet has a high spot to rule its kingdom from, and keep an eye on what you are doing.